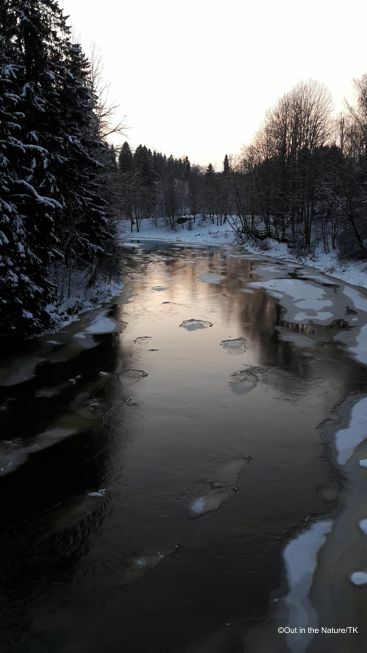 Rapids rarely freeze even in the coldest of winters even though the water flowing through the rapids may actually be below 0°C (32 °F), making it supercool. 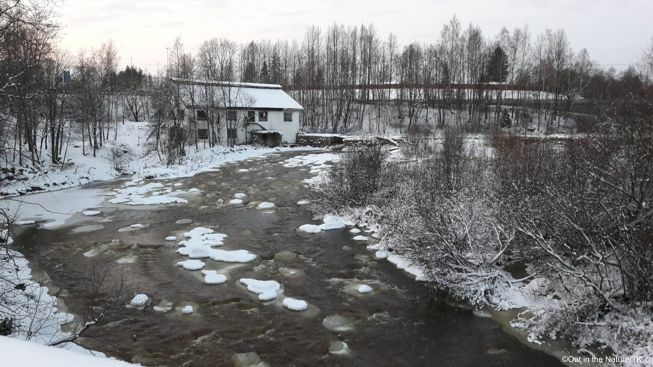 The flowing water resists becoming a solid also in Vantaa river, where the rapids start next to an old file and rasp factory (Vanha viilatehdas). The nostalgic factory sits downstream from the rapids, overlooking the on-coming foam-crested waves. There has been a factory here from early 1800s to the 1960s. 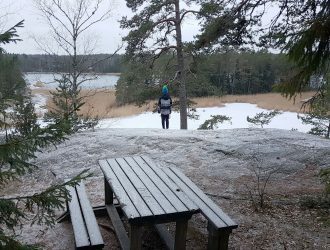 At the Vantaankoski rapids, despite the occasional airplane flying towards the nearby airport, the captivating atmosphere makes you forget about the urban environment around you. The road running above the rapids is called Kuninkaantie, meaning King’s road. 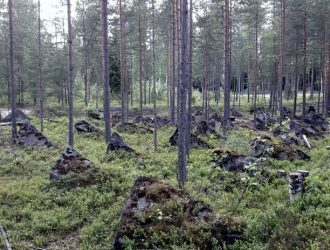 The King’s Road was part of a medieval mail road that stretched from Bergen in today’s Norway to Vyborg in today’s Russia (because Finland was under Swedish rule until 1809). The best views of the rapids are from the bridge; however, there are cars passing by so it’s not the most secure place to stop enjoy the views. You can easily stay at either end of the bridge and get the same views, without getting hit by a car. There is a short walkway up to the rapids on both sides upstream. You can also walk downstream next to the old factory or across from it. Around the bend from the rapids and past the factory is a lovely red bridge and some wooden stairs you can use to walk down to the river. If you walk over the bridge, there is an official walkpath to your left that follows the river and ends up at a villa on the other side of the rapids. The walk is relatively short, only about 2km, of which about 900m goes next to the river. 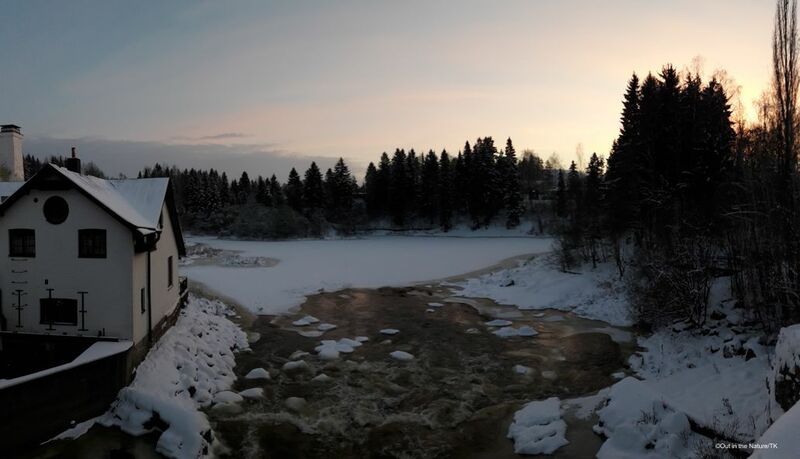 The Vantaanjoki river doesn’t just have one set of rapids; it has six on its 99km stretch! If you are an avid fisher, the river offers different places to catch some fish, from rapids to almost brook-like conditions. 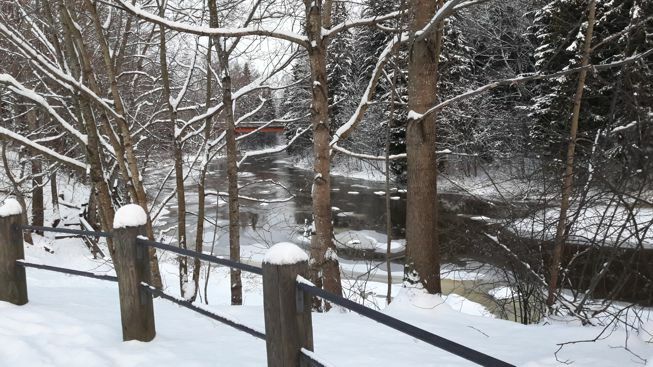 You can check out helpful tips for fishing at the Vantaa river from FishinginFinland. Fish found in the river are such as perch, pike, rainbow trout, rudd, salmon, and sea trout. Always remember to respect Everyman’s rights, and also purchase a fishing permission if you want to fish at the rapids. There is so much to do by the river and its estuaries that it almost boggles the mind. Besides fishing and angling, it is a great place for all sorts of water sports such as kayaking and white-water rafting. One route starts from the Vantaankoski rapids and continues 8.5km downstream towards the Haltiala farm: it has three rapids making it moderately challenging. The kayaking routes have been marked with signs so they are easily visible for visitors. Of course you can also swim in the river even though the waters tend to be a bit muddy. There is also a path suitable for walking and cycling running along river, leading you around to the lovely Villa Smeds and back. Address: Type Kuninkaantie 26, Vantaa on your navigator. It will take you to the car park area nearest to the rapids. Note that there are two carparks: one for customers of the nearby restaurant, one for visitors of the area. There are also some other places to park your car nearby. 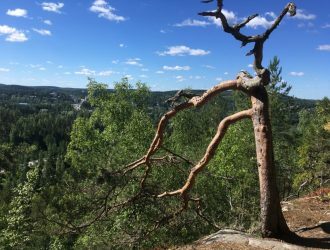 How to get there: You can get to the Vantaankoski rapids by car, by bicycle, and by public transport. Car: Set Kuninkaantie 26, Vantaa in your navigator. This takes you to a small carpark where you can park your car. From there, you can walk to smaller roads next to the rapids. Bicycle: It’s easy to cycle on dedicated cycling/pedestrian routes to the rapids. Public transport: Buses go very close to the rapids, and the travel time from Helsinki takes about 30mins. Check timetables from the Capital area Routeplanner. The nearest bus stop is called Ruukinranta, Vantaa. The walk from this bus stop to the rapids is about 300m. Accessibility: The area is generally very accessible so you can go around in a wheelchair or have a buggy for children. When to go: You can visit the area at any time of the year: the rapids and nature around offer something for every season. Special to remember: If you want to swim in the area, check it doesn’t have blue-green algae in it as it’s a health hazard to humans and animals. 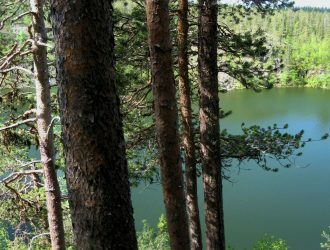 The Lake Wiki shows up-to-date algae info. Also note that this area is not safe for ice swimming. If you want to fish in the rapids, remember to purchase a permit.